Dive safe we owe it to those who love us! Welcome and thank you for subscribing to my e-zine. 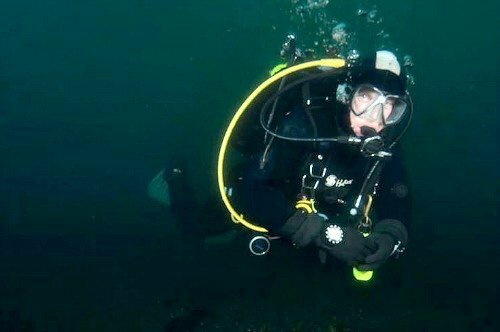 In this edition I would like to talk about Wreck, or, Artificial Reef Diving in Nanaimo. Here we have three ships that you can dive. The H.M.C.S Saskatchewan, H.M.C.S. Cape Breton, and the Rivtow Lion, which are all magnificent ships that after de-commission from the second world war, were bought, prepared, and sunk as "Artificial Reefs" by the Nanaimo Dive Association. Diving the two large war ships by Snake Island, requires advanced scuba diving certification, and experience, mostly due to depth. It is also recommended to use a Nitrox blend, or re-breather equipment, to maximize your bottom time. The 2 large war ships are barely recognizable now, as there is an incredible amount of Plumose anemones attached to much of the surface structure of these vessels. Because of this, these ships also attract a large amount, and variety of fish. You will find many types of Rockfish, Lingcod, Cabezon, Perch, Wolf eels, Octopus, Crabs, Mollusks...and on...you may even get approached by inquisitive Sea Lions. If you are into penetrating the wrecks, you can do that too! As I mentioned, these ships were specifically prepared as dive sites, and are relatively safe, provided one has the appropriate training, equipment, and experience. The Rivtow Lion is also a great option for diving, particularly if the weather is poor. This Artificial Reef is also attractive because of its relatively shallow depth, hence it becomes accessible to newer (open water certified divers), as well. I would also highly recommend this wreck as a night dive! You will also need to get there! I would recommend using either Ed Singer, owner of Sundown Diving (250-753-1880), or Shepherd Charters out of Nanaimo Dive Outfitters(250-756-1863), both are located in Nanaimo, BC. Both of these businesses also have Websites, and Facebook sites that are easy to find and access as well. Accommodations can be found at a Diver Friendly hotel called the Buccaneer Inn (250-753-1246), located very close to the BC Ferries terminal in Departure Bay. The hotel is also close to the docks where you will board your charter to get out to the wrecks. The Buccaneer Inn has nice clean affordable rooms, a place to wash the salt water from your gear, and specific rooms with racks for hanging, and drying your gear. So hey! There are courses to take, and new, or "new to you" gear to take out and try. So check out your local dive shop, or surf the web for some online deals (used Victoria periodically has some awesome deals, and I also find Craigslist good, though you may have to travel a little). One thing I would say though is that divers on the whole are a very honest group when it comes to buying used. Having said that, it still pays to do your research. Anyway fellow divers and friends, take care, and remember what my old dive buddy and mentor Bob S. always said. "A great dive is any dive that you come back from" Bob certainly had that right.